Katie Myers and her husband live in Palm Beach and are ecstatic when they find out they are going to have a kid together. A little boy. 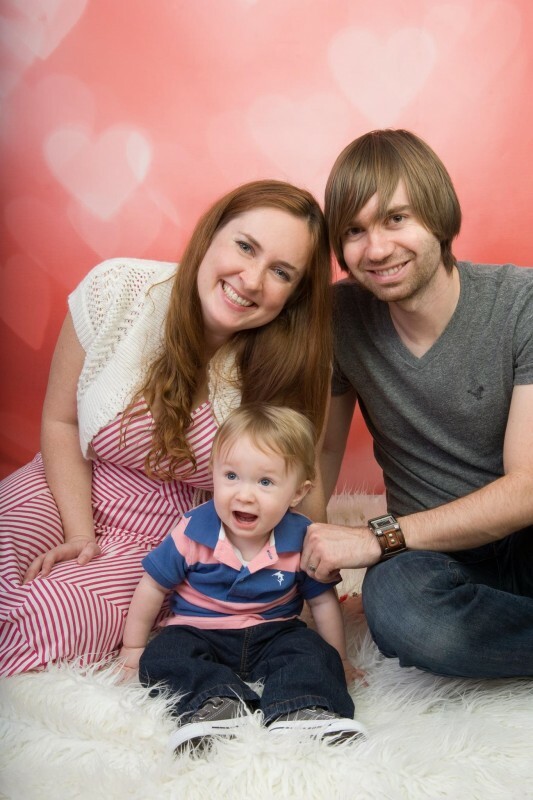 The pregnancy progresses perfectly and Kaden, their son, fills his parents' lives with joy and love. But just months after his birth, his mother begins to become terrified. She realizes that the 1-and-a-half Kaden is not developing as quickly as his age peers. Today, the mother regrets comparing her child with others. 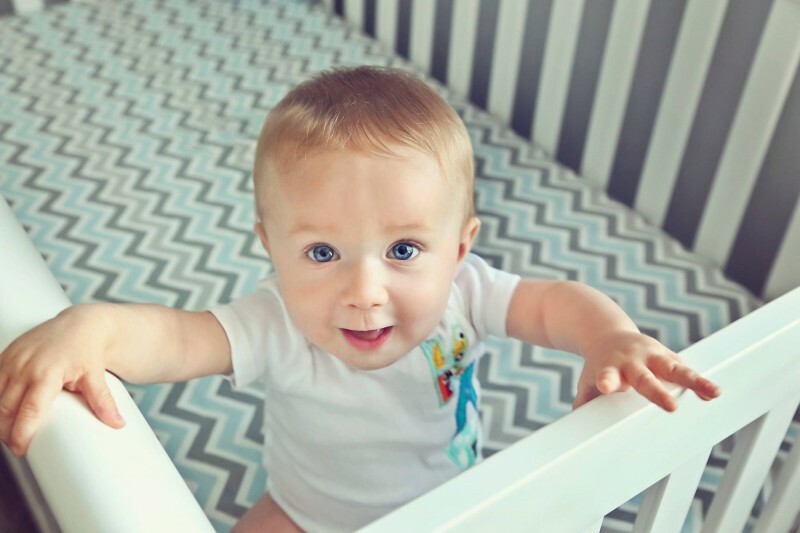 A doctor eventually gives them a ghastly diagnosis: Kaden is suffering from spinal muscular atrophy, type 2. He will never be able to walk without help. He will only be able to sit up with extreme effort. He will not grow old. Katie fights for her son and Kaden fights too! Every day, he fiercely struggles through another step forward in his life. He learns to sit up, to raise his arms. Eventually, he can use a wheelchair. Katie is unbelievably proud of her little battler. 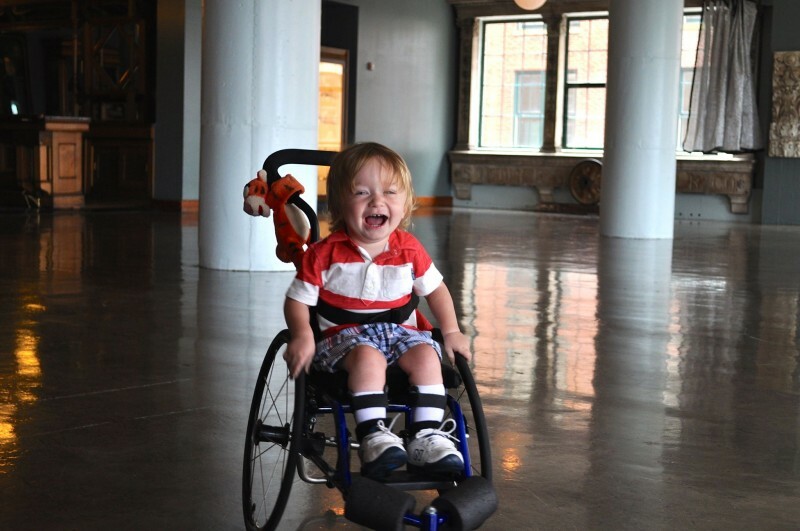 They go to the museum and aquarium often because of the flat floors that Kaden can roll on with his wheelchair—it's a nice diversion for him. One day, they are witnesses to a wonderful meeting. 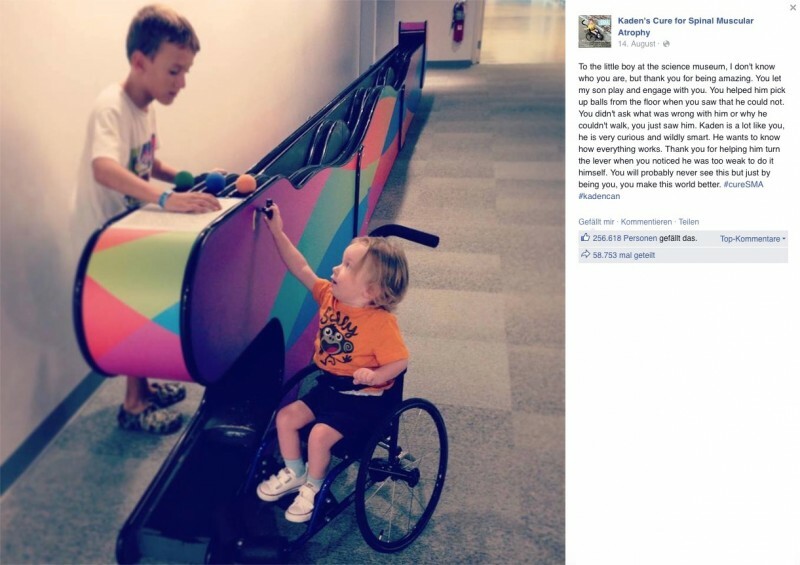 "To the little boy at the science museum, I don't know who you are, but thank you for being amazing. You let my son play and engage with you. You helped him pick up balls from the floor when you saw that he could not. You didn't ask what was wrong with him or why he couldn't walk, you just saw him. Kaden is a lot like you, he is very curious and wildly smart. He wants to know how everything works. Thank you for helping him turn the lever when you noticed he was too weak to do it himself. You will probably never see this but just by being you, you make this world better." The anonymous boy seemed to not even notice his play companion's wheelchair or his cumbersome movements! Without a single question, he plays with Kaden. 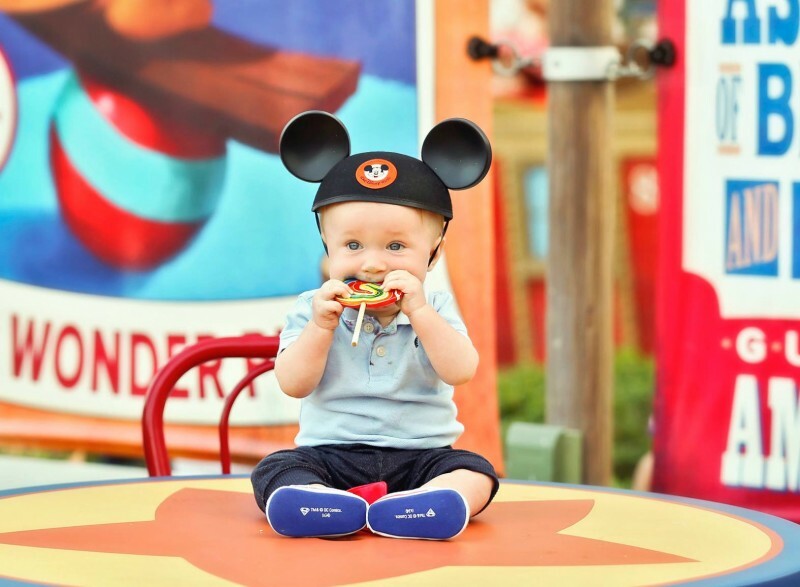 "I would love to tell his parents how unbelievable and caring their son is that he treats everyone the same," says Katie. The mother explains in an interview later that there is nothing wrong with asking questions about Kaden. But this carefree time with a playmate, free of probing questions, was simply incomparable. Being seen as a normal child and being treated as such, means a lot for the little boy who fights for his survival every day. 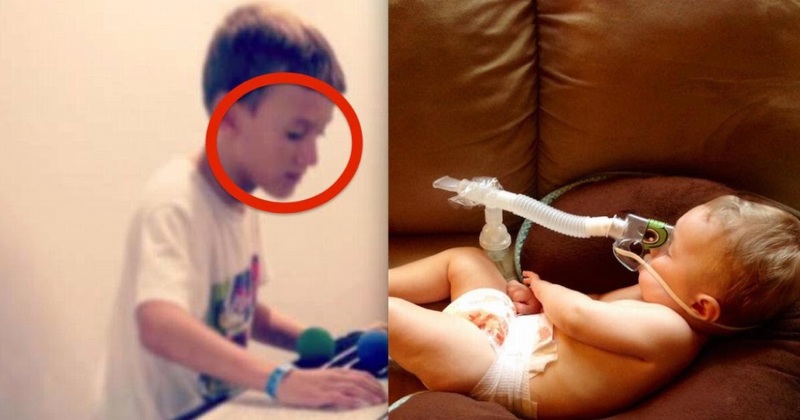 With the photo, Katie would like to find the young boy to thank him personally, on the one hand, and on the other to spread awareness about Kaden's illness. An illness that tortures the boy so much. 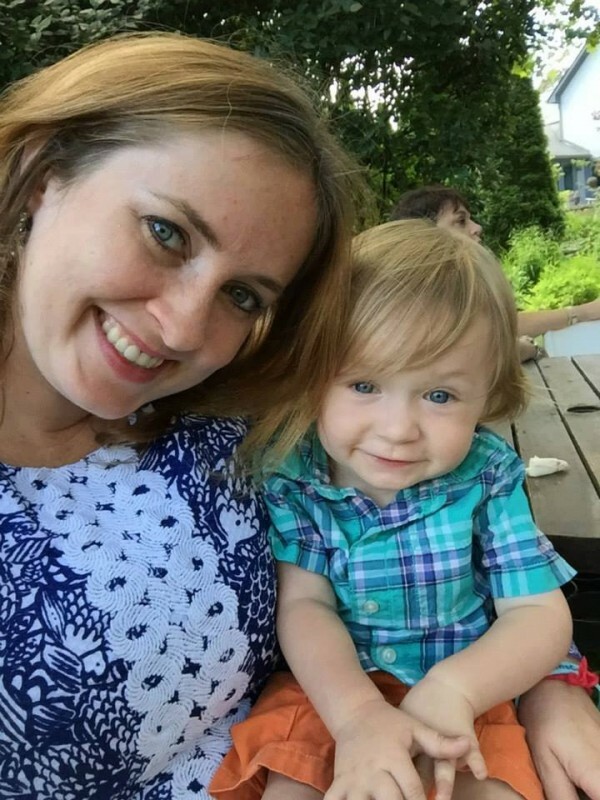 Help this wonderful mother and share this article!